Madiba would be proud. 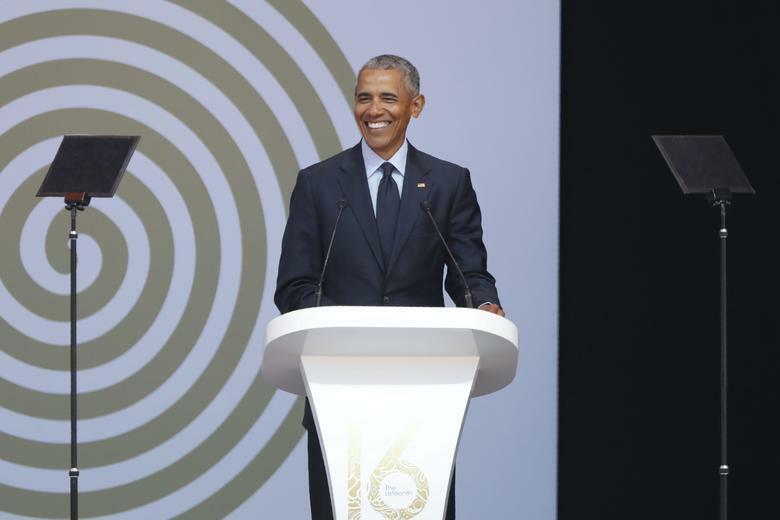 Former United States President Barack Obama addressed a large crowd in South Africa at the annual Nelson Mandela Lecture to honor the Nobel Prize winning, humanitarian hero and late president of South Africa Nelson Mandela. This is the first high-profile speech given by Pres. Obama since leaving office in January 2017. The Nelson Mandela Annual Lecture comes at an opportune time for human rights activists concerned with recent U.S. immigration policy. Exclusion of immigrants from Muslim-majority countries, along with the the detention and separation of children and babies from their parents are but a few of the recent policies drawing criticism from allies worldwide. Pres. Obama did not disappoint with the thoroughness with which he criticized the 'politics of today.' These remarks appeared to openly reference the naivety and dangerous rhetoric of his successor. In one speech, Pres. Obama managed to uplift the sovereignty of democratic institutions including the free press, while he condemned shameless leaders who "double down" when caught in lies. Most notably present in today's lecture, in typical Barack Obama fashion, the former leader of the free world encouraged his international audience to remember the healing power of hope. PRESIDENT OBAMA: Thank you. To Mama Graça Machel, members of the Mandela family, the Machel family, to President Ramaphosa who you can see is inspiring new hope in this great country – (cheers and applause) – professor, doctor, distinguished guests, to Mama Sisulu and the Sisulu family, to the people of South Africa – (cheers and applause) – it is a singular honor for me to be here with all of you as we gather to celebrate the birth and life of one of history's true giants. Confession number two: I forgot my geography and the fact that right now it's winter in South Africa. (Laughter.) I didn't bring a coat, and this morning I had to send somebody out to the mall because I am wearing long johns. (Laughter.) I was born in Hawaii. Confession number three: When my staff told me that I was to deliver a lecture, I thought back to the stuffy old professors in bow ties and tweed, and I wondered if this was one more sign of the stage of life that I'm entering, along with gray hair and slightly failing eyesight. I thought about the fact that my daughters think anything I tell them is a lecture. (Laughter.) I thought about the American press and how they often got frustrated at my long-winded answers at press conferences, when my responses didn't conform to two-minute soundbites. But given the strange and uncertain times that we are in – and they are strange, and they are uncertain – with each day's news cycles bringing more head-spinning and disturbing headlines, I thought maybe it would be useful to step back for a moment and try to get some perspective. So I hope you'll indulge me, despite the slight chill, as I spend much of this lecture reflecting on where we've been, and how we arrived at this present moment, in the hope that it will offer us a roadmap for where we need to go next. One hundred years ago, Madiba was born in the village of M – oh, see there, I always get that – (laughter) – I got to get my Ms right when I'm in South Africa. Mvezo – I got it. (Cheers and applause.) Truthfully, it's because it's so cold my lips stuck. (Laughter.) So in his autobiography he describes a happy childhood; he's looking after cattle, he's playing with the other boys, eventually attends a school where his teacher gave him the English name Nelson. And as many of you know, he's quoted saying, "Why she bestowed this particular name upon me, I have no idea." There was no reason to believe that a young black boy at this time, in this place, could in any way alter history. After all, South Africa was then less than a decade removed from full British control. Already, laws were being codified to implement racial segregation and subjugation, the network of laws that would be known as apartheid. Most of Africa, including my father's homeland, was under colonial rule. The dominant European powers, having ended a horrific world war just a few months after Madiba's birth, viewed this continent and its people primarily as spoils in a contest for territory and abundant natural resources and cheap labor. And the inferiority of the black race, an indifference towards black culture and interests and aspirations, was a given. Madiba's light shone so brightly, even from that narrow Robben Island cell, that in the late '70s he could inspire a young college student on the other side of the world to reexamine his own priorities, could make me consider the small role I might play in bending the arc of the world towards justice. And when later, as a law student, I witnessed Madiba emerge from prison, just a few months, you'll recall, after the fall of the Berlin Wall, I felt the same wave of hope that washed through hearts all around the world. Do you remember that feeling? It seemed as if the forces of progress were on the march, that they were inexorable. Each step he took, you felt this is the moment when the old structures of violence and repression and ancient hatreds that had so long stunted people's lives and confined the human spirit – that all that was crumbling before our eyes. And then as Madiba guided this nation through negotiation painstakingly, reconciliation, its first fair and free elections; as we all witnessed the grace and the generosity with which he embraced former enemies, the wisdom for him to step away from power once he felt his job was complete, we understood that – (applause) – we understood it was not just the subjugated, the oppressed who were being freed from the shackles of the past. The subjugator was being offered a gift, being given a chance to see in a new way, being given a chance to participate in the work of building a better world. And during the last decades of the 20th century, the progressive, democratic vision that Nelson Mandela represented in many ways set the terms of international political debate. It doesn't mean that vision was always victorious, but it set the terms, the parameters; it guided how we thought about the meaning of progress, and it continued to propel the world forward. Yes, there were still tragedies – bloody civil wars from the Balkans to the Congo. Despite the fact that ethnic and sectarian strife still flared up with heartbreaking regularity, despite all that as a consequence of the continuation of nuclear détente, and a peaceful and prosperous Japan, and a unified Europe anchored in NATO, and the entry of China into the world's system of trade – all that greatly reduced the prospect of war between the world's great powers. And from Europe to Africa, Latin America, Southeast Asia, dictatorships began to give way to democracies. The march was on. A respect for human rights and the rule of law, enumerated in a declaration by the United Nations, became the guiding norm for the majority of nations, even in places where the reality fell far short of the ideal. Even when those human rights were violated, those who violated human rights were on the defensive. And with these geopolitical changes came sweeping economic changes. The introduction of market-based principles, in which previously closed economies along with the forces of global integration powered by new technologies, suddenly unleashed entrepreneurial talents to those that once had been relegated to the periphery of the world economy, who hadn't counted. Suddenly they counted. They had some power; they had the possibilities of doing business. And then came scientific breakthroughs and new infrastructure and the reduction of armed conflicts. And suddenly a billion people were lifted out of poverty, and once-starving nations were able to feed themselves, and infant mortality rates plummeted. And meanwhile, the spread of the internet made it possible for people to connect across oceans, and cultures and continents instantly were brought together, and potentially, all the world's knowledge could be in the hands of a small child in even the most remote village. That's what happened just over the course of a few decades. And all that progress is real. It has been broad, and it has been deep, and it all happened in what – by the standards of human history – was nothing more than a blink of an eye. And now an entire generation has grown up in a world that by most measures has gotten steadily freer and healthier and wealthier and less violent and more tolerant during the course of their lifetimes. So we have to start by admitting that whatever laws may have existed on the books, whatever wonderful pronouncements existed in constitutions, whatever nice words were spoken during these last several decades at international conferences or in the halls of the United Nations, the previous structures of privilege and power and injustice and exploitation never completely went away. They were never fully dislodged. (Applause.) Caste differences still impact the life chances of people on the Indian subcontinent. Ethnic and religious differences still determine who gets opportunity from the Central Europe to the Gulf. It is a plain fact that racial discrimination still exists in both the United States and South Africa. (Cheers and applause.) And it is also a fact that the accumulated disadvantages of years of institutionalized oppression have created yawning disparities in income, and in wealth, and in education, and in health, in personal safety, in access to credit. Women and girls around the world continue to be blocked from positions of power and authority. (Cheers and applause.) They continue to be prevented from getting a basic education. They are disproportionately victimized by violence and abuse. They're still paid less than men for doing the same work. That's still happening. (Cheers and applause.) Economic opportunity, for all the magnificence of the global economy, all the shining skyscrapers that have transformed the landscape around the world, entire neighborhoods, entire cities, entire regions, entire nations have been bypassed. And while globalization and technology have opened up new opportunities, have driven remarkable economic growth in previously struggling parts of the world, globalization has also upended the agricultural and manufacturing sectors in many countries. It's also greatly reduced the demand for certain workers, has helped weaken unions and labor's bargaining power. It's made it easier for capital to avoid tax laws and the regulations of nation-states – can just move billions, trillions of dollars with a tap of a computer key. And the result of all these trends has been an explosion in economic inequality. It's meant that a few dozen individuals control the same amount of wealth as the poorest half of humanity. (Applause.) That's not an exaggeration, that's a statistic. Think about that. In many middle-income and developing countries, new wealth has just tracked the old bad deal that people got because it reinforced or even compounded existing patterns of inequality, the only difference is it created even greater opportunities for corruption on an epic scale. And for once solidly middle-class families in advanced economies like the United States, these trends have meant greater economic insecurity, especially for those who don't have specialized skills, people who were in manufacturing, people working in factories, people working on farms. In every country just about, the disproportionate economic clout of those at the top has provided these individuals with wildly disproportionate influence on their countries' political life and on its media; on what policies are pursued and whose interests end up being ignored. Now, it should be noted that this new international elite, the professional class that supports them, differs in important respects from the ruling aristocracies of old. It includes many who are self-made. It includes champions of meritocracy. And although still mostly white and male, as a group they reflect a diversity of nationalities and ethnicities that would have not existed a hundred years ago. A decent percentage consider themselves liberal in their politics, modern and cosmopolitan in their outlook. Unburdened by parochialism, or nationalism, or overt racial prejudice or strong religious sentiment, they are equally comfortable in New York or London or Shanghai or Nairobi or Buenos Aires, or Johannesburg. Many are sincere and effective in their philanthropy. Some of them count Nelson Mandela among their heroes. Some even supported Barack Obama for the presidency of the United States, and by virtue of my status as a former head of state, some of them consider me as an honorary member of the club. (Laughter.) And I get invited to these fancy things, you know? (Laughter.) They'll fly me out. But what's nevertheless true is that in their business dealings, many titans of industry and finance are increasingly detached from any single locale or nation-state, and they live lives more and more insulated from the struggles of ordinary people in their countries of origin. (Applause.) And their decisions – their decisions to shut down a manufacturing plant, or to try to minimize their tax bill by shifting profits to a tax haven with the help of high-priced accountants or lawyers, or their decision to take advantage of lower-cost immigrant labor, or their decision to pay a bribe – are often done without malice; it's just a rational response, they consider, to the demands of their balance sheets and their shareholders and competitive pressures. But too often, these decisions are also made without reference to notions of human solidarity – or a ground-level understanding of the consequences that will be felt by particular people in particular communities by the decisions that are made. And from their board rooms or retreats, global decision-makers don't get a chance to see sometimes the pain in the faces of laid-off workers. Their kids don't suffer when cuts in public education and health care result as a consequence of a reduced tax base because of tax avoidance. They can't hear the resentment of an older tradesman when he complains that a newcomer doesn't speak his language on a job site where he once worked. They're less subject to the discomfort and the displacement that some of their countrymen may feel as globalization scrambles not only existing economic arrangements, but traditional social and religious mores. Which is why, at the end of the 20th century, while some Western commentators were declaring the end of history and the inevitable triumph of liberal democracy and the virtues of the global supply chain, so many missed signs of a brewing backlash – a backlash that arrived in so many forms. It announced itself most violently with 9/11 and the emergence of transnational terrorist networks, fueled by an ideology that perverted one of the world's great religions and asserted a struggle not just between Islam and the West but between Islam and modernity, and an ill-advised U.S. invasion of Iraq didn't help, accelerating a sectarian conflict. (Applause.) Russia, already humiliated by its reduced influence since the collapse of the Soviet Union, feeling threatened by democratic movements along its borders, suddenly started reasserting authoritarian control and in some cases meddling with its neighbors. China, emboldened by its economic success, started bristling against criticism of its human rights record; it framed the promotion of universal values as nothing more than foreign meddling, imperialism under a new name. Within the United States, within the European Union, challenges to globalization first came from the left but then came more forcefully from the right, as you started seeing populist movements – which, by the way, are often cynically funded by right-wing billionaires intent on reducing government constraints on their business interests – these movements tapped the unease that was felt by many people who lived outside of the urban cores; fears that economic security was slipping away, that their social status and privileges were eroding, that their cultural identities were being threatened by outsiders, somebody that didn't look like them or sound like them or pray as they did. So on Madiba's 100th birthday, we now stand at a crossroads – a moment in time at which two very different visions of humanity's future compete for the hearts and the minds of citizens around the world. Two different stories, two different narratives about who we are and who we should be. How should we respond? Should we see that wave of hope that we felt with Madiba's release from prison, from the Berlin Wall coming down – should we see that hope that we had as naïve and misguided? Should we understand the last 25 years of global integration as nothing more than a detour from the previous inevitable cycle of history – where might makes right, and politics is a hostile competition between tribes and races and religions, and nations compete in a zero-sum game, constantly teetering on the edge of conflict until full-blown war breaks out? Is that what we think? Let me tell you what I believe. I believe in Nelson Mandela's vision. I believe in a vision shared by Gandhi and King and Abraham Lincoln. I believe in a vision of equality and justice and freedom and multi-racial democracy, built on the premise that all people are created equal, and they're endowed by our creator with certain inalienable rights. (Cheers and applause.) And I believe that a world governed by such principles is possible and that it can achieve more peace and more cooperation in pursuit of a common good. That's what I believe. The fact that the world's most prosperous and successful societies, the ones with the highest living standards and the highest levels of satisfaction among their people, happen to be those which have most closely approximated the liberal, progressive ideal that we talk about and have nurtured the talents and contributions of all their citizens. The fact that authoritarian governments have been shown time and time again to breed corruption, because they're not accountable; to repress their people; to lose touch eventually with reality; to engage in bigger and bigger lies that ultimately result in economic and political and cultural and scientific stagnation. Look at history. Look at the facts. We have a better story to tell. But to say that our vision for the future is better is not to say that it will inevitably win. Because history also shows the power of fear. History shows the lasting hold of greed and the desire to dominate others in the minds of men. Especially men. (Laughter and applause.) History shows how easily people can be convinced to turn on those who look different, or worship God in a different way. So if we're truly to continue Madiba's long walk towards freedom, we're going to have to work harder and we're going to have to be smarter. We're going to have to learn from the mistakes of the recent past. And so in the brief time remaining, let me just suggest a few guideposts for the road ahead, guideposts that draw from Madiba's work, his words, the lessons of his life. Now, I don't believe in economic determinism. Human beings don't live on bread alone. But they need bread. And history shows that societies which tolerate vast differences in wealth feed resentments and reduce solidarity and actually grow more slowly; and that once people achieve more than mere subsistence, then they're measuring their well-being by how they compare to their neighbors, and whether their children can expect to live a better life. And when economic power is concentrated in the hands of the few, history also shows that political power is sure to follow – and that dynamic eats away at democracy. Sometimes it may be straight-out corruption, but sometimes it may not involve the exchange of money; it's just folks who are that wealthy get what they want, and it undermines human freedom. And how we achieve this is going to vary country to country, and I know your new president is committed to rolling up his sleeves and trying to do so. But we can learn from the last 70 years that it will not involve unregulated, unbridled, unethical capitalism. It also won't involve old-style command-and-control socialism form the top. That was tried; it didn't work very well. For almost all countries, progress is going to depend on an inclusive market-based system – one that offers education for every child; that protects collective bargaining and secures the rights of every worker – (applause) – that breaks up monopolies to encourage competition in small and medium-sized businesses; and has laws that root out corruption and ensures fair dealing in business; that maintains some form of progressive taxation so that rich people are still rich but they're giving a little bit back to make sure that everybody else has something to pay for universal health care and retirement security, and invests in infrastructure and scientific research that builds platforms for innovation. I mean, it shows a poverty of ambition to just want to take more and more and more, instead of saying, "Wow, I've got so much. Who can I help? How can I give more and more and more?" (Cheers and applause.) That's ambition. That's impact. That's influence. What an amazing gift to be able to help people, not just yourself. (Applause.) Where was I? I ad-libbed. (Laughter.) You get the point. But even as there are discussions to be had around trade and commerce, it's important to recognize this reality: while the outsourcing of jobs from north to south, from east to west, while a lot of that was a dominant trend in the late 20th century, the biggest challenge to workers in countries like mine today is technology. And the biggest challenge for your new president when we think about how we're going to employ more people here is going to be also technology, because artificial intelligence is here and it is accelerating, and you're going to have driverless cars, and you're going to have more and more automated services, and that's going to make the job of giving everybody work that is meaningful tougher, and we're going to have to be more imaginative, and the pact of change is going to require us to do more fundamental reimagining of our social and political arrangements, to protect the economic security and the dignity that comes with a job. It's not just money that a job provides; it provides dignity and structure and a sense of place and a sense of purpose. (Applause.) And so we're going to have to consider new ways of thinking about these problems, like a universal income, review of our workweek, how we retrain our young people, how we make everybody an entrepreneur at some level. But we're going to have to worry about economics if we want to get democracy back on track. Embracing our common humanity does not mean that we have to abandon our unique ethnic and national and religious identities. Madiba never stopped being proud of his tribal heritage. He didn't stop being proud of being a black man and being a South African. But he believed, as I believe, that you can be proud of your heritage without denigrating those of a different heritage. (Applause.) In fact, you dishonor your heritage. It would make me think that you're a little insecure about your heritage if you've got to put somebody else's heritage down. (Laughter.) Yeah, that's right. (Laughter.) Don't you get a sense sometimes – again, I'm ad-libbing here – that these people who are so intent on putting people down and puffing themselves up that they're small-hearted, that there's something they're just afraid of. Madiba knew that we cannot claim justice for ourselves when it's only reserved for some. Madiba understood that we can't say we've got a just society simply because we replaced the color of the person on top of an unjust system, so the person looks like us even though they're doing the same stuff, and somehow now we've got justice. That doesn't work. (Cheers and applause.) It's not justice if now you're on top, so I'm going to do the same thing that those folks were doing to me and now I'm going to do it to you. That's not justice. "I detest racialism," he said, "whether it comes from a black man or a white man." Now, we have to acknowledge that there is disorientation that comes from rapid change and modernization, and the fact that the world has shrunk, and we're going to have to find ways to lessen the fears of those who feel threatened. In the West's current debate around immigration, for example, it's not wrong to insist that national borders matter; whether you're a citizen or not is going to matter to a government, that laws need to be followed; that in the public realm newcomers should make an effort to adapt to the language and customs of their new home. Those are legitimate things and we have to be able to engage people who do feel as if things are not orderly. But that can't be an excuse for immigration policies based on race, or ethnicity, or religion. There's got to be some consistency. And we can enforce the law while respecting the essential humanity of those who are striving for a better life. (Cheers and applause.) For a mother with a child in her arms, we can recognize that could be somebody in our family, that could be my child. When he was freed from prison, Madiba's popularity – well, you couldn't even measure it. He could have been president for life. Am I wrong? (Laughter.) Who was going to run against him? (Laughter.) I mean, Ramaphosa was popular, but come on. (Laughter.) Plus he was a young – he was too young. Had he chose, Madiba could have governed by executive fiat, unconstrained by check and balances. But instead he helped guide South Africa through the drafting of a new Constitution, drawing from all the institutional practices and democratic ideals that had proven to be most sturdy, mindful of the fact that no single individual possesses a monopoly on wisdom. No individual – not Mandela, not Obama – are entirely immune to the corrupting influences of absolute power, if you can do whatever you want and everyone's too afraid to tell you when you're making a mistake. No one is immune from the dangers of that. Mandela understood this. He said, "Democracy is based on the majority principle. This is especially true in a country such as ours where the vast majority have been systematically denied their rights. At the same time, democracy also requires the rights of political and other minorities be safeguarded." He understood it's not just about who has the most votes. It's also about the civic culture that we build that makes democracy work. So we have to stop pretending that countries that just hold an election where sometimes the winner somehow magically gets 90 percent of the vote because all the opposition is locked up – (laughter) – or can't get on TV, is a democracy. Democracy depends on strong institutions and it's about minority rights and checks and balances, and freedom of speech and freedom of expression and a free press, and the right to protest and petition the government, and an independent judiciary, and everybody having to follow the law. And yes, democracy can be messy, and it can be slow, and it can be frustrating. I know, I promise. (Laughter.) But the efficiency that's offered by an autocrat, that's a false promise. Don't take that one, because it leads invariably to more consolidation of wealth at the top and power at the top, and it makes it easier to conceal corruption and abuse. For all its imperfections, real democracy best upholds the idea that government exists to serve the individual and not the other way around. (Applause.) And it is the only form of government that has the possibility of making that idea real. So for those of us who are interested in strengthening democracy, let's also stop – it's time for us to stop paying all of our attention to the world's capitals and the centers of power and to start focusing more on the grassroots, because that's where democratic legitimacy comes from. Not from the top down, not from abstract theories, not just from experts, but from the bottom up. Knowing the lives of those who are struggling. As a community organizer, I learned as much from a laid-off steel worker in Chicago or a single mom in a poor neighborhood that I visited as I learned from the finest economists in the Oval Office. Democracy means being in touch and in tune with life as it's lived in our communities, and that's what we should expect from our leaders, and it depends upon cultivating leaders at the grassroots who can help bring about change and implement it on the ground and can tell leaders in fancy buildings, this isn't working down here. Most of us prefer to surround ourselves with opinions that validate what we already believe. You notice the people who you think are smart are the people who agree with you. (Laughter.) Funny how that works. But democracy demands that we're able also to get inside the reality of people who are different than us so we can understand their point of view. Maybe we can change their minds, but maybe they'll change ours. And you can't do this if you just out of hand disregard what your opponents have to say from the start. And you can't do it if you insist that those who aren't like you – because they're white, or because they're male – that somehow there's no way they can understand what I'm feeling, that somehow they lack standing to speak on certain matters. Madiba, he lived this complexity. In prison, he studied Afrikaans so that he could better understand the people who were jailing him. And when he got out of prison, he extended a hand to those who had jailed him, because he knew that they had to be a part of the democratic South Africa that he wanted to build. "To make peace with an enemy," he wrote, "one must work with that enemy, and that enemy becomes one's partner." So those who traffic in absolutes when it comes to policy, whether it's on the left or the right, they make democracy unworkable. You can't expect to get 100 percent of what you want all the time; sometimes, you have to compromise. That doesn't mean abandoning your principles, but instead it means holding on to those principles and then having the confidence that they're going to stand up to a serious democratic debate. That's how America's Founders intended our system to work – that through the testing of ideas and the application of reason and proof it would be possible to arrive at a basis for common ground. And I should add for this to work, we have to actually believe in an objective reality. This is another one of these things that I didn't have to lecture about. You have to believe in facts. (Laughter.) Without facts, there is no basis for cooperation. If I say this is a podium and you say this is an elephant, it's going to be hard for us to cooperate. (Laughter.) I can find common ground for those who oppose the Paris Accords because, for example, they might say, well, it's not going to work, you can't get everybody to cooperate, or they might say it's more important for us to provide cheap energy for the poor, even if it means in the short term that there's more pollution. At least I can have a debate with them about that and I can show them why I think clean energy is the better path, especially for poor countries, that you can leapfrog old technologies. (Cheers.) I can't find common ground if somebody says climate change is just not happening, when almost all of the world's scientists tell us it is. I don't know where to start talking to you about this. (Laughter.) If you start saying it's an elaborate hoax, I don't know what to – (laughter) – where do we start? Unfortunately, too much of politics today seems to reject the very concept of objective truth. People just make stuff up. They just make stuff up. We see it in state-sponsored propaganda; we see it in internet driven fabrications, we see it in the blurring of lines between news and entertainment, we see the utter loss of shame among political leaders where they're caught in a lie and they just double down and they lie some more. Politicians have always lied, but it used to be if you caught them lying they'd be like, "Oh man." Now they just keep on lying. By the way, this is what I think Mama Graça was talking about in terms of maybe some sense of humility that Madiba felt, like sometimes just basic stuff, me not completely lying to people seems pretty basic, I don't think of myself as a great leader just because I don't completely make stuff up. You'd think that was a base line. Anyway, we see it in the promotion of anti-intellectualism and the rejection of science from leaders who find critical thinking and data somehow politically inconvenient. And, as with the denial of rights, the denial of facts runs counter to democracy, it could be its undoing, which is why we must zealously protect independent media; and we have to guard against the tendency for social media to become purely a platform for spectacle, outrage, or disinformation; and we have to insist that our schools teach critical thinking to our young people, not just blind obedience. Which, I'm sure you are thankful for, leads to my final point: we have to follow Madiba's example of persistence and of hope. Because, we've been through darker times, we've been in lower valleys and deeper valleys. Yes, by the end of his life, Madiba embodied the successful struggle for human rights, but the journey was not easy, it wasn't pre-ordained. The man went to prison for almost three decades. He split limestone in the heat, he slept in a small cell, and was repeatedly put in solitary confinement. And I remember talking to some of his former colleagues saying how they hadn't realized when they were released, just the sight of a child, the idea of holding a child, they had missed – it wasn't something available to them, for decades. And yet his power actually grew during those years – and the power of his jailers diminished, because he knew that if you stick to what's true, if you know what's in your heart, and you're willing to sacrifice for it, even in the face of overwhelming odds, that it might not happen tomorrow, it might not happen in the next week, it might not even happen in your lifetime. Things may go backwards for a while, but ultimately, right makes might, not the other way around, ultimately, the better story can win out and as strong as Madiba's spirit may have been, he would not have sustained that hope had he been alone in the struggle, part of buoyed him up was that he knew that each year, the ranks of freedom fighters were replenishing, young men and women, here in South African, in the ANC and beyond; black and Indian and white, from across the countryside, across the continent, around the world, who in those most difficult days would keep working on behalf of his vision. And that's what we need right now, we don't just need one leader, we don't just need one inspiration, what we badly need right now is that collective spirit. And, I know that those young people, those hope carriers are gathering around the world. Because history shows that whenever progress is threatened, and the things we care about most are in question, we should heed the words of Robert Kennedy – spoken here in South Africa, he said, "Our answer is the world's hope: it is to rely on youth. It's to rely on the spirit of the young." So, young people, who are in the audience, who are listening, my message to you is simple, keep believing, keep marching, keep building, keep raising your voice. Every generation has the opportunity to remake the world. Mandela said, "Young people are capable, when aroused, of bringing down the towers of oppression and raising the banners of freedom." Now is a good time to be aroused. Now is a good time to be fired up. And, for those of us who care about the legacy that we honor here today – about equality and dignity and democracy and solidarity and kindness, those of us who remain young at heart, if not in body – we have an obligation to help our youth succeed. Some of you know, here in South Africa, my Foundation is convening over the last few days, two hundred young people from across this continent who are doing the hard work of making change in their communities; who reflect Madiba's values, who are poised to lead the way. People like Enock Nkulanga, who directs the African Children's mission, which helps children in Uganda and Kenya get the education that they need and then in his spare time, Enock advocates for the rights of children around the globe, and founded an organization called LeadMinds Africa, which does exactly what it says. You meet these people, you talk to them, they will give you hope. They are taking the baton, they know they can't just rest on the accomplishments of the past, even the accomplishments of those as momentous as Nelson Mandela's. They stand on the shoulders of those who came before, including that young black boy born 100 years ago, but they know that it is now their turn to do the work. Madiba reminds us that: "No one is born hating another person because of the color of his skin, or his background, or his religion. People must learn to hate, and if they can learn to hate, they can be taught to love, for love comes more naturally to the human heart." Love comes more naturally to the human heart, let's remember that truth. Let's see it as our North Star, let's be joyful in our struggle to make that truth manifest here on earth so that in 100 years from now, future generations will look back and say, "they kept the march going, that's why we live under new banners of freedom." Thank you very much, South Africa, thank you. Pres. Obama showed the country what it lost in leadership and moral clarity with the 2016 election. But also, Barack Obama showed the world why he was the most fitting candidate to lead the United States out of the ruinous moral doldrums of the Bush administration. Democracy, civility, and hope. That is the legacy of Barack Obama and that is the light he inherited from Nelson Mandela.